Czech artist Alphonse Mucha's Art Nouveau style makes for perfectly lovely blank cards and art prints. 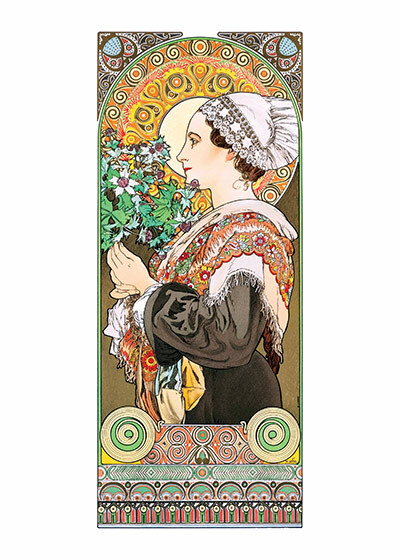 Czech artist Alphonse Mucha's Art Nouveau style makes for perfectly lovely blank cards and art prints. These prints are made at our location in Seattle, WA. They have a thick, white backing board and are sealed in clear bags. Each is suitable for framing at 11 inches x 14 inches or can be used as is for wall display. Our goal is to bring back to life these wonderful illustrations from old-fashioned, children's books and from early advertising art.